“I was told I had to come to your tasting room, and I’m glad I did. Bedford Winery Tasting Room & Courtyard: 448 Bell Street, Los Alamos. Superlative wines. Great conversation. Relaxed ambience. Take the path less traveled and enjoy the ultimate wine experience here in historic Los Alamos. This is what wine tasting should be with a knowledgeable staff giving each customer one on one attention, great wines that are not main stream, and an unrushed, intimate atmosphere. There is usually a special event upcoming, so sign up for our emails or check-in regularly to the “Events“ section. Tasting Room Hours: 11 am to 5 pm daily. Weekends we are often open longer depending on the situation and weather. $10 tasting fee per person. No wine tasting charge for Wine Club Members. 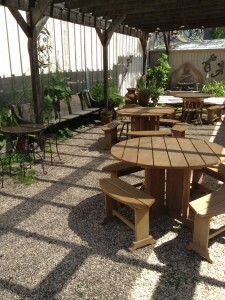 Wine by the glass available, so bring a picnic lunch and enjoy our outdoor garden. Courtyard is available for private parties (up to 80 guests). Contact tasting room for details and availability. Come To Los Alamos: Haven’t been to Los Alamos lately? It’s time for another look. This is a quirky but friendly town that harkens back to a bygone era, and it’s attracting maverick business owners and artists. Bell Street Farm Eatery and Market is a fabulous place for an upscale lunch, and Full of Life Flatbread, now open Thursday through Sunday, always has a line out the door for dinner. Our new next door neighbor is Pico’s which is open for dinner offering inventive American cuisine – a definite hangout! Bob’s Well Bread in LA has the best bread anyhere and other baked goods along with a wonderful breakfast and lunch menu. There are four other tasting rooms: Casa Dumetz, Frequency, Municipal Winemakers, and Babbi’s Beer Emporium for those who enjoy artisan beers (I know I do!). Along with a myriad of antique shops, there is The C Gallery for the art minded. Need a place to stay? We have the Victorian Mansion with six themed suites, and for the price conscientious, the Los Alamos Motel – no frills but clean and cute. The money saved you can spend on wine. Come to “LA” north and stay awhile!